This weekend something caught my eye during tajweed class. We spend the last part of the two-hour lesson opening the Quran and practising reciting after the teacher to get our pronunciation right. We usually use one of the Qurans kept in the masjid, so I end up with a different version every time. This time I picked up one that had the translation of the meaning written in Urdu under the Arabic text. One thing that has always stood out to me is the difference between English and Urdu interpretations. I have always found the Urdu version so much more powerful and awe-inspiring than the English, I am not sure why. Perhaps the Urdu language is closer to Arabic than English. 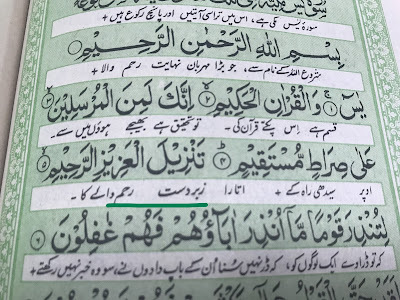 Perhaps there is a much longer history of studying the Quran by Urdu speakers than English. "[This is] a revelation of the Exalted in Might, the Merciful." The words in Urdu are zabardast reham walay or the One with “zabardast” mercy. Zabardast can be translated as devastating or extraordinary. 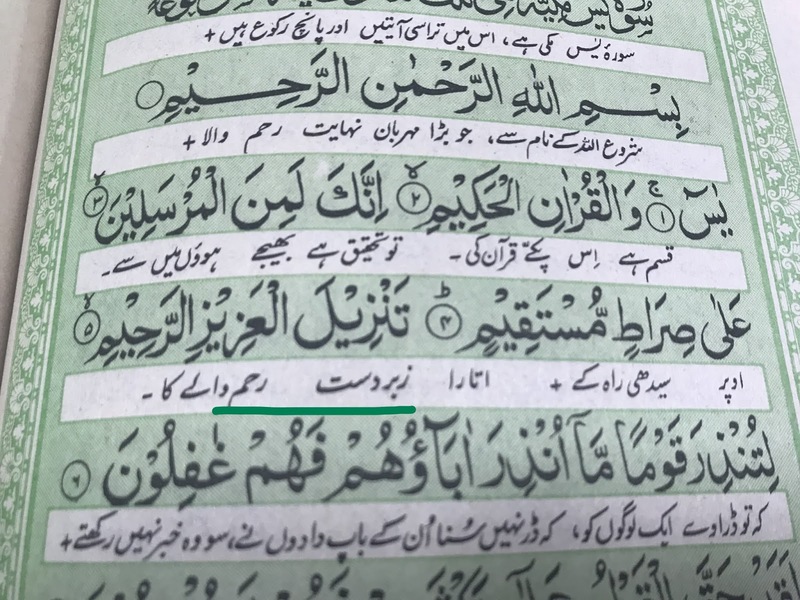 I read the Urdu and it stopped me in my tracks. A Created that is devastatingly merciful, extraordinary merciful. Both qualities are astonishing and incredibly beautiful. In that moment it got me thinking of all the guilt, self-reproach and feeling of not getting it right we carry around. How hopeless we can feel in the face of our mistakes and the smallness of our worship and good deeds. It reminded me how big, merciful and loving our Creator is. Something to draw hope from, more than that to bask in. It’s not an excuse to be lazy in our actions or look at what we do and try and do better. But it was such a perfect reminder to help me find a little peace.